DO inject some humor into your subject line. Dad's not afraid of a cheesy one-liner. You shouldn't be, either. Catch your subscriber's eye with a lighthearted joke, a little wordplay, or that hallmark of dad style, a corny pun. Tommy Bahama, 6/11--Everydad style for Father’s Day | FREE 2-day shipping ends tomorrow! DON'T be afraid to get sappy. The best Father's Day copy this year proves the way to a man's heart is through his...heart. 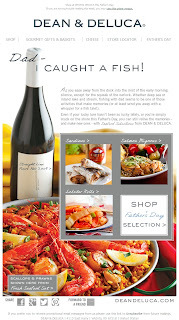 These examples from Dean & Deluca do a great job of telling a story that appeals to their subscriber's emotions. It doesn't really matter whether everyone who reads this email has a dad who loves baseball or fishing. They're sure to be reminded of what their father IS passionate about, and they'll be inspired to find him the perfect gift. 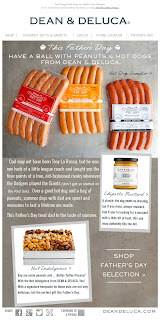 DEAN & DELUCA, 6/7--A Hot Dog at the ballgame beats roast beef at the Ritz. DEAN & DELUCA, 6/12--All men are equal before fish. DO be a broken record. 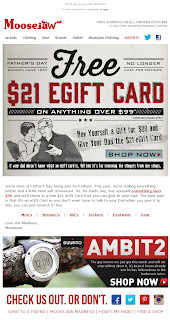 Be honest: how long did it take you to actually purchase a Father's Day gift? Did you put it off a few times before you finally clicked "Complete Order"? If my inbox is any indication, we could all use a little motivation. 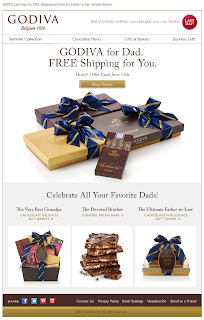 I noticed retailers sending up to 4 or 5 emails dedicated to Father's Day, each touch upping the urgency. Special consideration was given to last-minute shoppers, with shipping messages taking center stage. The takeaway: don't give up on us, Dad! We'll get you a gift--eventually. Not every retailer has a dad-centric inventory. So what? Repurpose your Father's Day send to appeal to anyone in the mood to shop. 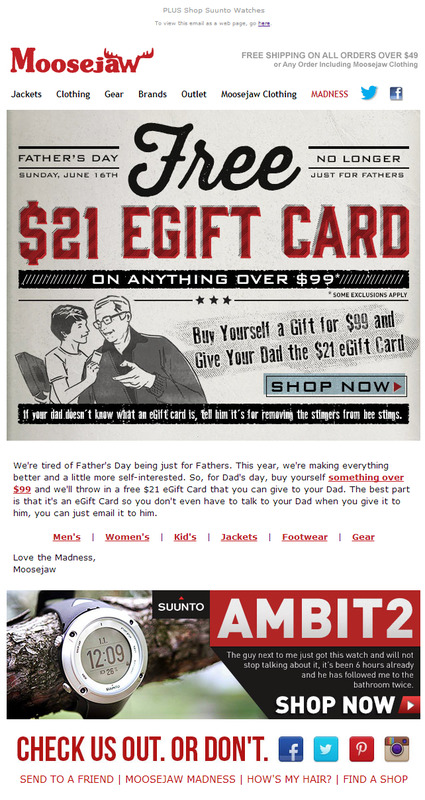 Moosejaw takes this idea for a snarky spin in this "Not Just for Dads" email. We've all seen retailers prompt shoppers to shop for themselves while they're buying holiday gifts; it looks like this tactic is expanding to other shopping holidays, too. Now it's your turn: Which emails have you been enthralled (or appalled) by this Father's Day?